The other night I went to Hannah’s for a little visit (apparently I cannot last much more than a day apart from her). Her parents were lovely enough to invite me out to dinner with them, and we headed to The Crooked Billet. Kate Winslet held the reception of her first wedding here. If it’s good enough for Kate, it’s good enough for me. They have the a clever idea of creating a Guinea Pig Menu to test out new dishes before they put them on the actual menu. The food was typically British but with an Asian twist. A bit like me. And Hannah. 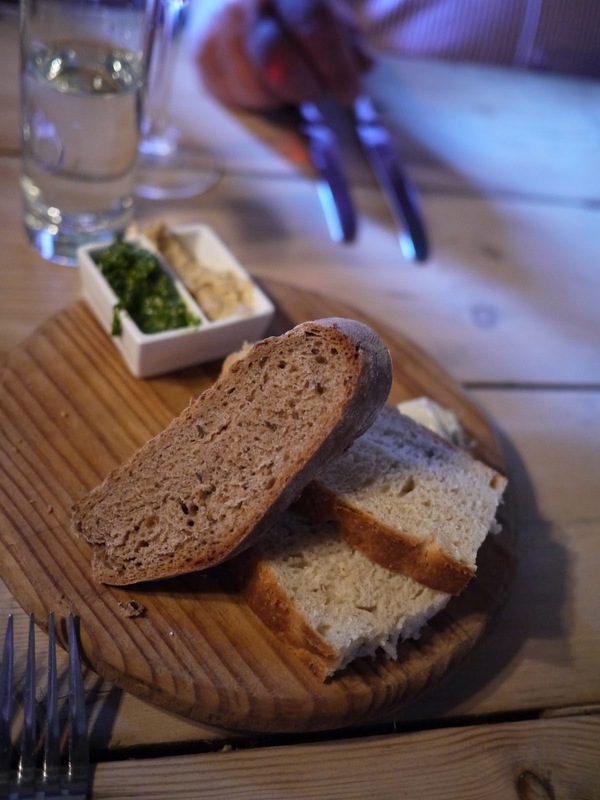 The meal started off with some bread, which Hannah and I tactically avoided direct eye-contact with. However, it came with homemade pesto and hummus which was delicious and which I ended up eating most of using my knife, like the classy lady that I am. The food was amazing, all being fresh and locally sourced. I had the rabbit satay with peanut sauce as a starter, which was the best decision I’d made all night (as well as shunning the bread). I was worried the peanut sauce would be thick like it typically is, but it was very light and subtle which went really well with the rabbit. Rabbit tastes a bit like chicken to me. I like chicken. Hannah had the scallops which she inhaled. The mains were equally as delicious. I had the kid cutlets which came with chargrilled broccoli and cauliflower fritters, and the others ordered the Thai crispy pork belly and roebuck rump steak. Trying to be as good as possible, Hannah asked to swap her potatoes with some green beans. You know the food is great when the table is silent because everyone is too busy eating. Conversation takes second place. I only had a juice in the morning so Hannah and I had barely eaten properly all day (besides a few snacks and our typical frozen yogurt), mainly because we had been distracted by Leo’s eyes watching The Great Gatsby earlier. This clearly meant we could share a dessert. We always somehow want to order the same thing which is perfect because we can share and order more, which is usually the case when we go to sushi together. 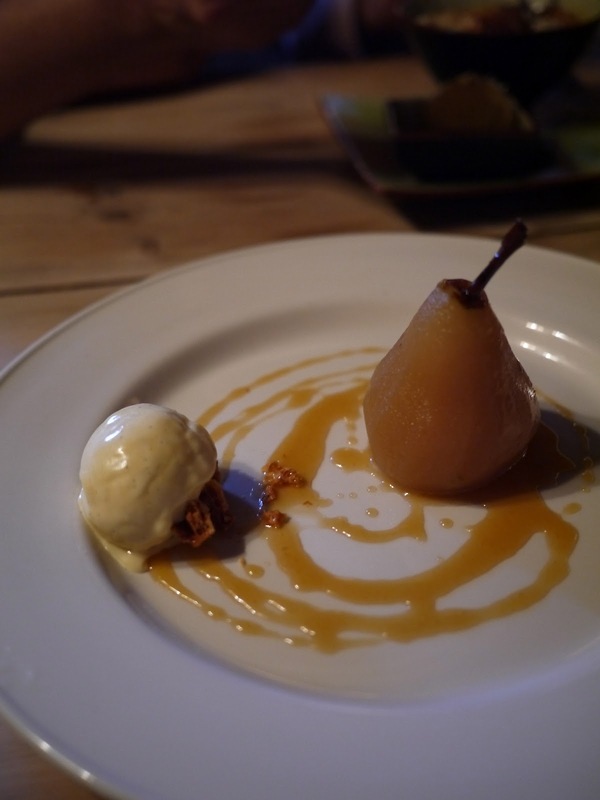 We got the poached pear (fruit = healthy) with ginger butterscotch and vanilla ice-cream (maybe not). 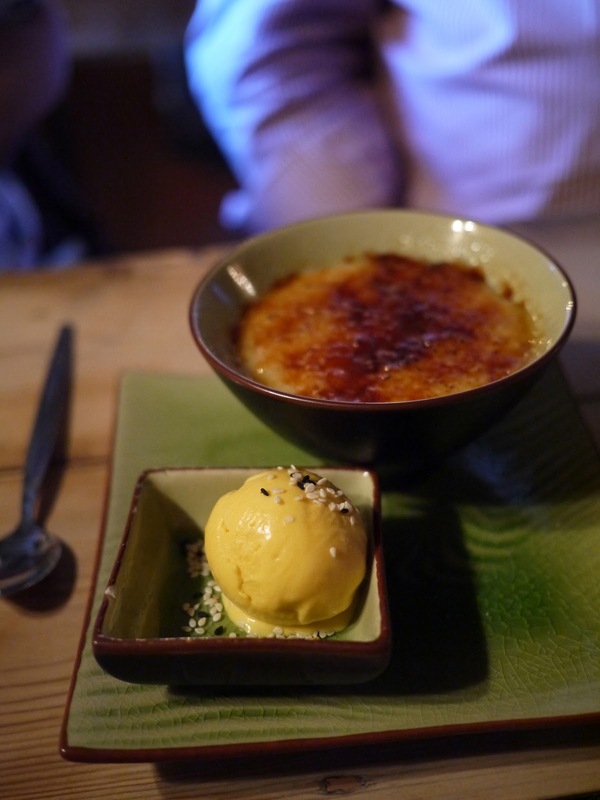 Her parents ordered the coconut and lemon grass rice pudding with burnt sugar and mango ice-cream, which was delicious even though I’m not usually a huge fan of rice pudding.